The pantomime season is almost upon us again (“Oh no it’s not!” - Ed). Oh yes it is, and this coming January (11th, 12th and 13th at Linlithgow Academy - see map under "Where to find us"). 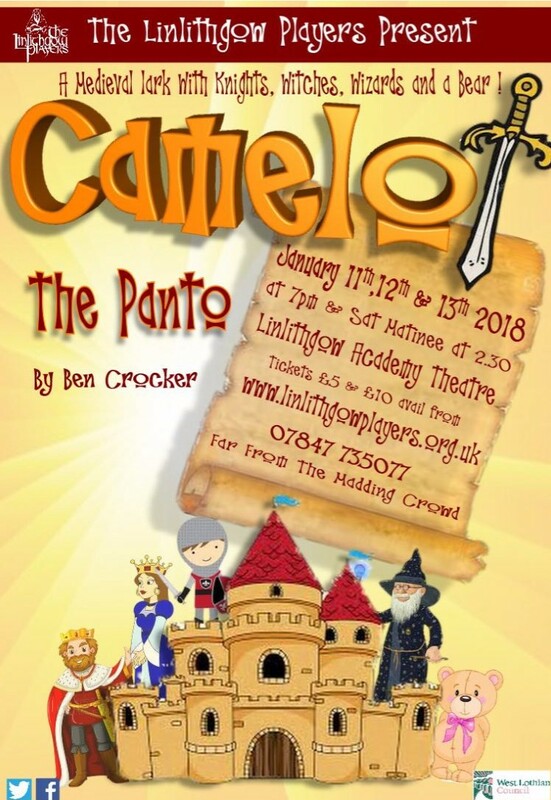 The Linlithgow Players will present the tale of Camelot, complete with men in tights, women in trousers and wizards in beards.. This fabulous Pantomime, written by Ben Crocker, weaves the magical Round Table myths together with Panto favourites to create the best of both worlds; a new fun story chock-full of well- loved characters. Faithful to traditional Pantomime you’ll meet Connie the Dame, played by a man in the time honoured fashion, and principle boy Prince Arthur (played by a woman) as they join forces with Merlin, Laughalot, Guinevere, Nell , King Uther and his Knights to do battle with malicious Morgan and vile Valerin, together with his jelly baby toting Mum. Stealing the stage is the Player’s special guest star Edwina Bear, a “truly pawesome talent” and there are many other enchanting characters too. on this website, from Far from the Madding Crowd or by phone on tel; 07847 735077, £10 adults, £5 children and concessions. Book quickly, the Saturday matinee is always sold out. As always, the Players are proud to welcome a number of rising young stars from one of the country’s leading dance schools, the Central Scotland Ballet School (CSBS), who will complement the drama and farce on stage with their own inspiring dance numbers.